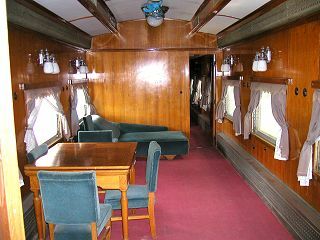 China's Prime minister, Zhou Enlai, traveled in a style compatible with his status and position. On the outside the railcar carried few special markings in order to avoid attracting unnecessary attention. The inside was however a different story. The first two photos depict his working and reception room. 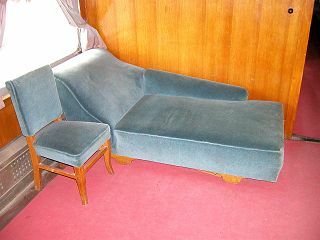 It is far from certain that this particular furniture was used by Zhou Enlai but the light armatures, paneling, top & bottom heating and the very spaciousness do not belie the intended occupant. In the center of the car there were not one but two separate bedrooms. 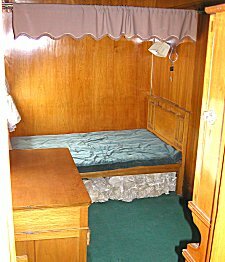 Each came with its own large bed, working desk and closet. Note the use of the old bakelite switch. 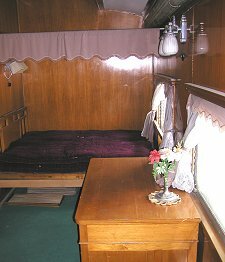 This material was replaced already in the late 1950s so it's use dates the wagon beautifully. 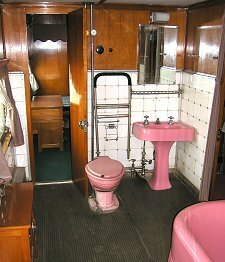 Between the 2 bedrooms was a large shared bathroom complete with sink, toilet and large bathtub with shower.